Welcome again to the BEST interview series! Today I want to introduce you to Diana Gonzalez, a.k.a. "The Craftaholic". Hi Diana. Welcome to the team! Tell us a little bit about yourself. I live in Brooklyn, baby! Being a stay at home mother and an artist, I strive to inspire others to think differently about their life, and about what they create and call art. Explain your name: Is there a story behind your Etsy-Name? Sweet Buddha? Well, sort of. I follow Buddha's teachings, and I wanted the name "Laughing Buddha" but it was taken. I kept playing around with the name on Etsy until I found one that wasn't taken. I wanted a name that reflected my spiritual path. I've always been an artist and a crafter, really. Bookmaking came into my life quite recently, out of necessity. About 3 years ago, I started hand binding my own books, because I wanted to recreate the beautiful books that are sold in chain bookstores. They were so pretty, but mass produced, and I wanted to make my own after hearing my husband say, "Diana those are easy to make, you can totally make that." I'm self-taught and work as a teaching artist. As of this coming August, I will have been teaching workshops for about four years. I run an art group thru meetup, where I host and teach art workshops of all kinds, such as jewelry making, block printing, and bookbinding. Its focus is on interdisciplinary arts, but we do a bit of everything creatively. I also have fun art swaps and social get-togethers with my group. That's my "real" job, on top of being a mother and wife. What do you make and sell? Is there someone who helps you with the shop? What materials do you use and what techniques are your favorites? I love to make books to sell. I usually make small batches of them, mostly because I get bored easily. I actually enjoy making all sorts of things. My husband and I designed a set of clear polymer rubber stamps and we have them for sale in our shop along with other items. I most often sell paper goods. In the future, I will be selling some of my photo transfer jewelry through my website. I love re-using and I love being eco-friendly with art and design. Most of the items in my shop are made from recycled materials. My books are made from old cardboard boxes, recycled paper, and old gift wrapping paper. Do you have a favorite book about books? My favorite book artist is Esther K. Smith. She works with her husband and they published a book called “How to Make Books”. 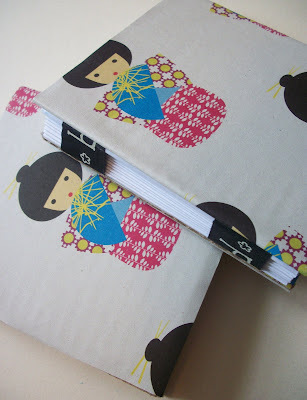 I love her style and I really love book making. Her book is an awesome tool for the bored book artist who wants to create new items for her shop, or just wants to be amused creatively. What do you call yourself: Book Artist, Book Maker, Book Binder - or something else? I call myself an artist because that's what I feel that I am. I think labels are tacky, but if you want a label, it's best if you label yourself based on what YOU think yourself to be. Is there a particular type of project that brings you the most joy? 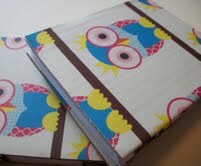 As corny as it sounds, I love making hand bound scrapbooks and "wish books". Scrapbooks are fun - I like making them, as much as I don't broadcast it, LOL. I like making wish books - these are similar to scrapbooks, but more artistic and contain the images and things that personify what you want in life, what your "wishes" are. Do you have a crafting hero/role model? Where is the source of your inspiration? I don't really have a "craft" hero. My source of inspiration is fine art. My favorite artist is Jean-Michel Basquiat, I consider him to be my hero. His art truly changed my life and how I view art. He lived and breathed art. He made art on anything and everything, which I find inspiring. I love that. For me, necessity is the mother of invention. I love to create things that I need, like journals, sketchbooks and jewelry. I do have new ideas for the shop. I have some new vintage items that I plan on incorporating in book making this year. Also, stay tuned for more art books and kits. Thanks Diana! It was great getting to know you! If you'd like to see Diana's work, check out her Etsy Shop. 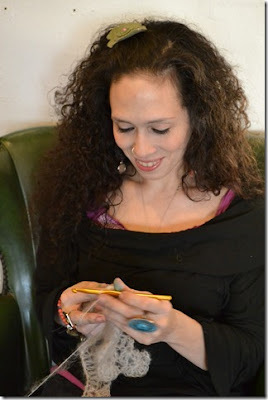 You can also learn more about her on her website, blog, and Facebook fan page.